Versatile and nutritious, oats kanji is wholesome and quick to make. Oats, whether rolled into flakes or steelcut, are rich in fiber - especially the soluble kind which helps reduce cholesterol and the other minerals, vitamins, and phytochemicals in them reduce the risk of many diseases and promote health in various ways. Oats always conjures up feelings of comfort and love for me. I used to be the "dubbawali"*, carrying the sweet oats kanji for my grandfather's special breakfast. My grandmother made it with lots of fresh milk and sugar. As my grandfather was long gone from the house to oversee the many activities on his farm, I was usually entrusted with taking the kanji to him. The job was not without its merits - grandfather always insisted on sharing some of the delicious kanji with me ;). Mm, What a treat!! Our other grandfather had oats kanji with milk and a banana every day too - he had it in the evening for his supper! He had given up regular food for his evening meal as a part of "vanaprastha", the third stage of life according to the ancient Indian philosophy called Sanatana Dharma meaning Eternal Righteousness. It was part of his disciplined way of life to rise every morning before dawn to do his exercises and meditations; he lived to be almost a hundred without any ailments whatsoever! He was impeccable in all aspects of hygiene and personal discipline including his laundry - he washed and ironed his own clothes meticulously even in his eighties. The only luxury he allowed himself was two Marie biscuits with his supper on occasion. And since he treated all the children present with a biscuit or two, he never lacked for company at supper time! * A "dubbawali (f) or dubbawala (m)", literally translated as 'box person', is someone who carries lunch boxes to students and office workers. Our particular dubbawala balanced many dubbas (stacked lunch containers similar to a Japanese bento box) in a large basket on his bicycle. It is amazing to me now that the food came perfectly on time, still piping hot with nary a mix up!! Do use regular (as opposed to instant) grains for the kanji; it really does not take much more time than the instant. The taste alone is worth the time and effort. Steel cut oats will require a lot more time than rolled oats; you can also use a multigrain cereal which contains many cracked/rolled grains such as rye, wheat, and barley in addition to oats. Once you have the basic kanji, you can choose either sweet or savory - add milk (any kind) and sugar or salt and buttermilk or yogurt. Both are delicious. Shobhaa's favorite way is to make it the savory by adding a few drops of the fiery red sauce from Kaduku Mangai Pickles (also known as Vadumangai - tiny mangoes flavored with mustard seeds and chilies) and serve some roasted papadams on the side to add a bit of crunch - yummy! Each Serving of Basic Kanji prepared with oats contains: 75 Calories; 2.5 g Protein; 1.5 g Fat; 13 g Carbohydrates; 2 g Fiber. Make the basic kanji: Bring the water to a boil in a 2 quart/liter pan. Add the oats with a pinch of salt and cook stirring until oats are soft. Or after returning the mixture to a good rolling boil, turn off heat, cover and let it sit for 5 minutes. Rolled oats cooks quickly and does not need a long cooking time. Steelcut oats will require more time to cook; cook according to package directions. Cover and let sit until cooled slightly. The basic kanji can be prepared ahead up to this point, reserved in the fridge, and reheated as necessary. A pressure cooker can speed up the cooking considerably. At this point you can choose one of the options or if you want to try both ways, mix one half with milk and the other with the buttermilk. For the Yogurt/Buttermilk option, simply mix salt and yogurt/buttermilk into the kanji and serve with toppings of your choice. Add more yogurt/buttermilk as needed. Serve warm or cool. For the sweet kanji, add hot, warm, or cold milk and sugar or your favorite sweetener to taste. More milk can be added if you prefer a thinner kanji. Serve hot or warm with your favorite toppings. 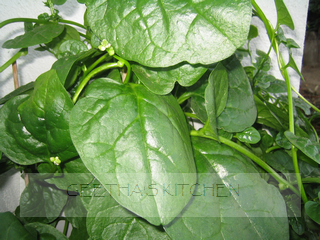 Variously called Malabar or Ceylon Spinach, Basale or Pasalai Keerai, Pui/Poi Saag, etc in the many Indian languages, Basella is a wonderful alternate for the regular spinach. It is used in other Asian cuisines as well. 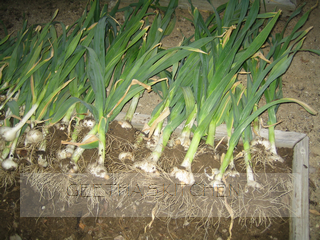 Basella grows readily during the hot summer months unlike the sensitive spinach which bolts into seeds at the barest whisper of warmth. 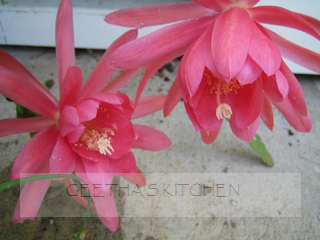 There are two varieties of basella - the green-stemmed alba and the red-stemmed rubra. Both are delicious and nutritious. 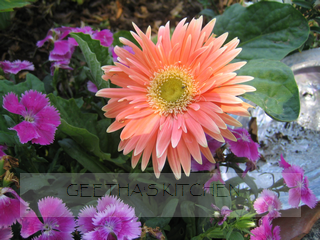 Lovely basella grows readily from cuttings or seeds. These plants grew from a few pieces of the stems I saved from a bunch bought for cooking. They can be rooted in water first or directly in a pot of soil; my experiments proved both methods to be successful. This particular plant is growing well in a large pot - although the vines are getting so long that they need a trellis - some of the leaves are larger than my hand! Practically all parts of the plants are useful; apparently even the roots are used. The tender vines as well as the leaves. tender stems thick or thin, buds, and berries are delicious. Leaves and stems may be added to any curry, stew or soup. The berries are a prized ingredient in East Indian cuisine and are crunchy even after cooking. The substantial and thick leaves of basella are somewhat succulent and slightly mucilaginous when raw. Once cooked, there does not seem to be any evidence of the stickiness. I have used regular spinach and basella interchangeably in recipes with great results. Basella is delicious in any recipe using spinach or Swiss chard; use it in any dal, molakootal, Mung bean & Basella Stew, Chettinad Style Spicy Dal, Thai Curry, stir-fry dishes and soups; it worked very well in rice salad too. Delicious Okra stir-fry is easy and delicious. 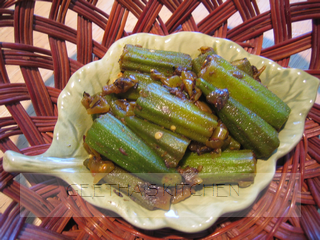 The key to cooking this okra dish is to make sure they are wiped dry thoroughly before cutting. The freshly pounded cumin seeds with the red chili, a classic spice combination in Kerala cuisine, add a wonderful nutty and earthy flavor which perfectly compliments the sweet green okra. Okra was one of our favorite veggies from early childhood. Amma told us it was good for our brains and made it quite often - we believed her and ate it up! Wash the okra and drain thoroughly; spread them on a thick towel to dry completely. 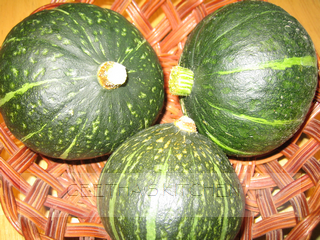 Simply cut off the stem ends and cut them into two or three pieces. Heat the oil in a kadai or skillet and cook the 1/4 tsp cumin seeds until fragrant. Stir in green chilies, curry leaves, onion, salt, and turmeric. Cook stirring until the onion pieces brown lightly. Add the okra and cook stirring often for about 5 minutes. Sprinkle the jeera masala and mix well to coat. Cover and cook the veggies for 2 to 3 minutes; remove the cover to allow steam to escape and stir well. Allowing the steam to escape helps keep the veggies dry and also retains their green color. Repeat the above step two or three times depending on how soft you would like the okra to be. Cook uncovered for a couple of minutes to evaporate any accumulated moisture. Stir in the chopped cilantro and the juice from the lime just before serving. Serve hot with rice/chapati and any lentil/bean dish for a complete meal. I had a beautiful and delicious rice salad recently - Pat had made it with Kalamata olives, red bell pepper, and spinach - very refreshing. I have tried to recreate it with the ingredients I had at hand and was quite happy with the result; here is my version with Keeshu's seal of approval! Cook the rice in scant 2 cups of water with the salt. Cool slightly - about 10 minutes. Prepare the dressing: mash the minced garlic and a pinch of salt on the cutting board with the side of a knife until macerated. Combine the garlic, lemon juice, olive oil, freshly ground black pepper, red pepper flakes, and all the herbs in a large mixing bowl. Whisk together well. Fluff the rice gently with a fork, add it while still hot to the dressing and gently mix. Stir in the leeks, spinach, and the arugula; the hot rice will wilt the veggies slightly. Allow the rice mixture to cool to room temperature, about 20 minutes. Stir in the rest of the ingredients and mix gently but thoroughly. Serve right away or chill until needed. Allow the salad to warm to room temperature if made ahead of time and chilled. Garnish with the pine nuts before serving. Ney Payasam is the offering prepared on the occasion of many holidays in honor of Divine Mother. I remember how wonderful it was when we had the annual Bhagavat Sevai pooja at home on a Friday evening. Our grandfather was busy over a huge bronze pan called 'uruli' full of ney payasam. All of us children had our jobs too; the most important one was to collect and prepare beautiful and fragrant flowers. The whole house and surroundings were cleaned thoroughly and the altar was gloriously decorated with rangoli (rice flour designs), lamps, and flowers. The warm golden glow of the oil lamps, the fragrance of the sandalwood incense, and the recitation of beautiful chants praising the divine transformed and transported our home into another plane. All who were assembled for the pooja turned our minds to dwell on the meaning of the melodious chants. Then it was finally the magical moment we had anticipated all day long - all the children were called forth to be blessed. Mere words cannot describe the enchanted and overwhelmingly grateful feelings we experienced as the elders and priests uttered blessings and showered us with a cascade of the blessed rose petals - the colorful, fragrant, soft shower brought such joy and contentment and left us feeling utterly and completely protected! Finally, when we were served the "prasad"( the blessed ney payasam), it made the special evening complete. The ney payasam is very rich and is served in small quantities. It is a perfect example of quality mattering over quantity. Paji's father used to make the rich payasam ever so richer with a double dose of the jaggery, honey and rock sugar, that one could barely eat a spoonful! We used to be amazed by the way the rice in the payasam turned glassy bathed in the syrup formed by all the jaggery, honey, and ghee. It is a matter of science actually - the principle of osmosis at work. The water moves from inside the rice (high water potential) to the outside of rice surrounded by the sugar (low water potential); this process makes the bloomed starch in the cooked rice shrivel a bit and makes it translucent. If you would like to know more about osmosis click here. Ney Payasam lasts a long time as sugar is an excellent preservative. It can be kept at room temperature in a covered container for at least a week. For longer storage, keep it in the fridge and allow it to warm to room temperature before serving. The ratio for traditional ney payasam is 1 measure rice:1 measure ghee:3 measures Jaggery. Here is my lean (compared to the traditional) version. Wash the rice well and cook in 1 cup of fresh water until soft. Chop the jaggery and add to the rice. Don't be alarmed when the rice becomes soupy; that is the effect of osmosis. 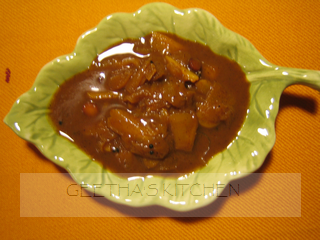 Cook until the jaggery forms a thick syrup and there is not much liquid left in the pan. Stir in one Tbsp of the ghee. Heat the remaining ghee in a small pan and and toast the cashew pieces; when they turn golden, add the coconut and cook stirring constantly until golden. Stir in the raisins if using and cook stirring until they puff up. Crush the cardamom pods slightly and take out the seeds; discard skins. Grind the cardamom seeds and the saffron with a pinch of sugar using a mortar and pestle until finely ground. Mix cardamom and the fried cashew mixtures into the payasam. Stir in the honey. Cover and let cool. Serve the payasam in small quantities. Sort, wash and cook the lentils with the salt in water to cover until soft. Set aside. Heat the oil in a large pan (2 quart/liter size) and cook the cumin seeds until lightly browned and fragrant. Add ginger and green chili and saute for a few seconds. Stir in onions with the salt & turmeric and cook until lightly browned. Add tomatoes, mix well and cook until soft. Stir in garam masala and the cooked lentils. Bring to a boil stirring often and turn off the heat. Cover and allow to rest for about 10 minutes. Mix in the chopped cilantro before serving. Serve hot over rice or with any kind of wholegrain flat bread. 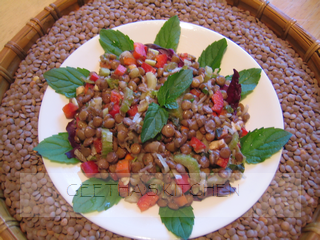 Protein and fiber-rich lentil salad is perfect for summer lunches and picnics! The walnuts provide extra protein as well as healthy Omega-3 oils. 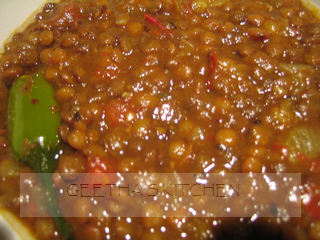 Sort the lentils for debris, wash well and cook in water to cover until tender but not mushy. Drain the cooking liquids and set aside for soup if you wish. Let the lentils cool slightly. Mix the oil, lemon juice, vinegar, salt and pepper in a large bowl and add the warm lentils. Stir gently to coat the lentils. Let cool. Add the rest of the ingredients and mix gently but thoroughly. Serve or chill until needed. Enjoy!! Here are some more pictures from the garden. Don't miss the special visitor! 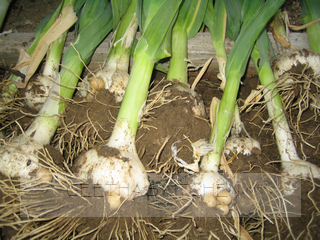 You can see the small bulb-lets on the garlic - "seeds" for next crop! 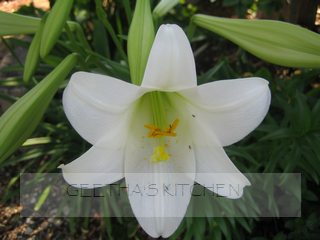 Reincarnation lily - comes back every year! A visitor in the garden!! 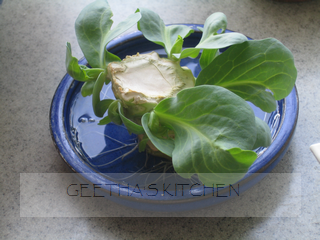 A humble cabbage core has so much energy still - sprouting new plants! After many kind admonitions and queries from friends, I feel that I must add a comment about the snake. Most were concerned for my safety; others were for the snake :). I am very, very respectful of the snakes as well as being extremely diligent - snakebite is a very serious situation as I saw when I researched the topic. 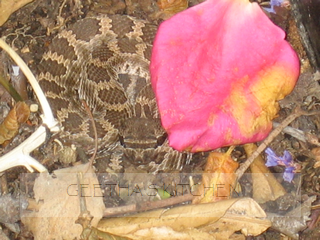 I have seen rattlers occasionally in the garden and am very careful to give them (and myself) lots of space. That particular one surprised me. It did not rattle or move at my approach or when I dropped the lid of the compost bin practically on top of it without looking down! I only saw it when I bent down to pick up the stick in the picture. The snake stayed put neatly coiled for several hours. It finally crawled away towards the evening. I felt that I owed it to myself and others to post a warning. Rattlesnakes DO NOT always rattle; they have been known to bite without any warning at all. 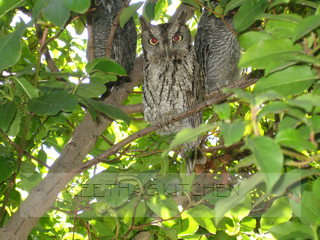 It is very easy to overlook them as they camouflage extremely well into the background as you can see in the picture. Rattlers are not aggressive typically and bite only when threatened or irritated. So, until cool weather forces them to hibernate, be wary (if you live in rattler country) when you step outside and also before allowing children or pets to go out into the garden. Here is a lovely chutney to spice up an otherwise simple meal. It makes a great appetizer spooned over cream cheese accompanied by whole grain crackers. Heat oil in a pan. add mustard seeds and chana dal. After the mustard seeds pop add hing powder, turmeric powder, & curry leaves. 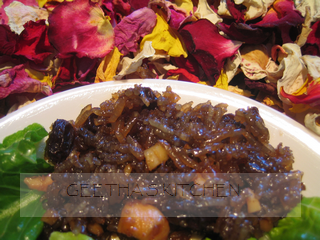 Add onions and garlic slices and saute' for few minutes till the onions are transparent and lightly colored. Add sambhar powder and mix well. Add the tamarind paste mixed with 1 cup water, the powdered jaggery or brown sugar and salt to taste. If too thick add 1/2 cup hot water and mix well. Cook for a few minutes till slightly thick like chutney. Remove from heat and stir in the ground fenugreek. Cool and store in clean jars. This chutney will last about 2 weeks in the refrigerator. 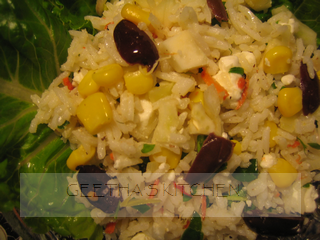 Serve with rice, chapati, etc; utterly delicious with Upma and yogurt rice! Bajjis are delectable little morsels of vegetable fritters (similar to Japanese tempura) just perfect to offer with afternoon tea or as appetizers. The secret to the bajjis is the special batter - the batter is made with besan (Hindi) or chick pea/garbanzo flour. The simple batter transforms the most ordinary of the veggies into amazingly tasty snacks. Pair the bajjis with a chutney or two of your choice - basic green, sweet and sour date-tamarind, fresh coconut, or green chili. 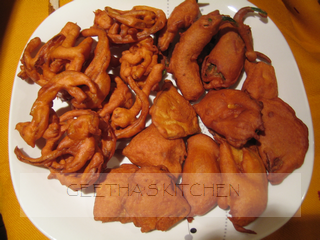 An explanation for the uninitiated: bajjis are slices or nuggets of veggies dipped in batter and deep fried; pakodas are chopped veggies mixed in a thick batter and fried. Although I do not make these very often since they are deep fried, they are a delicious addition to the menu occasionally. Both bajjis and pakodas are vegan and gluten-free. Almost any vegetable can be made into a bajji; vegetables with a high moisture content such as tomatoes are not suitable though. Summer squashes like zucchini, yellow squash; regular or sweet potatoes, eggplant, green and ripe bananas or plantains, onions, cauliflower, broccoli, hot and mild peppers, etc make wonderful bajjis. 6. thin wedges of apple. 7. small whole peppers (slit and seeds removed) like Jalapeno or other mild chilies, etc. When there are an assortment of shapes and sizes, the fun of guessing what you are going to sink your teeth into adds to the delight of eating them. To serve 4 people generously, I use one each of: a small Japanese type eggplant, a small green banana or a potato, a small onion, and a small zucchini and 1/3 of a block of paneer cheese. Mix the besan, rice flour, salt, chili powder, and just enough water to make a fairly thick batter. The batter should coat the veggies without completely running off. Set aside until veggies are prepared. Prepare thin slices of your choice of vegetables and arrange them on a plate. Eggplant, green banana, potato, etc will become brown if prepared too far in advance; prepare them just before using. If you use hot chilies like Jalapeno, slit/halve them and remove the seeds and core; sprinkle lightly with salt. Heat the oil for frying in a kadai (Indian frying pan) or other suitable pan until hot; a tiny drop of batter should brown pretty quickly but not burn. CAUTION: Be careful around the hot oil; if water drops into the hot oil, it will splash out violently. Dip veggies one slice at a time and gently slip into the hot oil being very careful not to splash the hot oil on yourself. Add as many slices as will fit without crowding the pan. The bajjis should cook for about 2 minutes on each side; when they are golden brown, turn with a slotted spoon to cook on the other side. Remove carefully from the oil when they are a nice deep golden brown with a slotted spoon and let them drain on paper towels. Continue cooking the rest of the bajjis. Serve hot with your favorite green and/or sweet chutneys accompanied by Masala Chai or Pudina Chai. This year the garden is prolific with not just flowers but lots of creatures too :-)! Although I have seen many kinds of birds, cotton tail rabbits, and squirrels, it is the very first year I have seen baby owls in our garden. 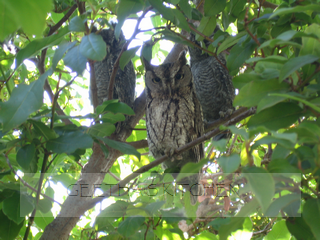 I found these owl babies (great horned owls, I believe) in the hedge when I was investigating some chirping sounds I heard one morning; they were very obliging to stay put while I went to fetch my camera. There were 5 of them actually but I would have had to disturb them by moving the branches to get all of them in the picture. 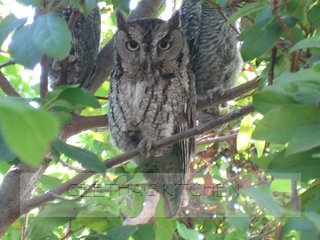 The owl babies seem to like these bushes to hang out during the day. Owl Babies: Sara, Percy and Bill? 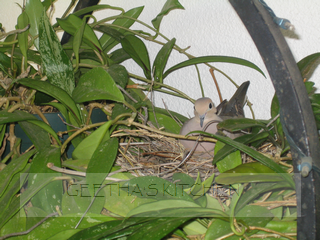 Here is a picture of one our resident Mourning Doves nesting right by our front door - they have been nesting every year for as long as I can remember. Initially everyone thinks it is only a decoration; they are amazed to find the bird is real! Ever wonder what I do with the ginormous amounts of cores, peels, and scraps which are generated with all the cooking I do? Well, compost of course! Here is something everyone can do to keep our Mother Earth beautiful - and of course our own gardens! Composting aids a great deal by relieving our overcrowded landfills in addition to providing all the free and rich mulch or soil-enrichment for our gardens. If anyone is motivated to start composting, it is really very simple. You can purchase compost bins (check your local county or city organizations for composting classes as well as for a nominally priced bins) or make your own. Location - Easy access to the bin is important. Also choose a spot that gets an equal amount of sun and shade so the compost does not dry out too quickly; keep it moist but not wet. Keep - a covered container lined with a paper towel (for easy clean up) in the kitchen to collect waste materials; when full, empty into the compost bin. I keep a container for the garden too to collect all the clippings, dry leaves, etc as I work. Chop - larger items such as watermelon rinds, corn cobs, melon shells, etc into small pieces before adding them to your container - I do this right along as I am preparing them and don't keep it for later. Garden trimmings should be cut into small pieces as well. Stir - the new material well into the existing pile using a stick, special compost turner or other garden tool. Stirring adds oxygen, another component for successful composting. Cover - food wastes with old leaves, other garden clippings, or some garden soil as this adds carbon as well as helps reduce fruit flies and odor. 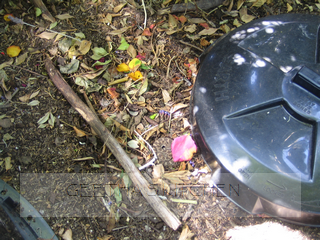 Cover the compost bin with a lid so it can do its job. Once you have set up your bin, just add shredded plain brown bags, cardboard and newspaper, daily scraps of fruits and veggies, garden clippings, leaves, etc. Sprinkle a few spadefuls of garden soil to add some microbes (bacteria, fungi) that will speed up the decomposition and perhaps a little water now and then to keep everything moist but not wet. NO meat/bones, greasy foods, dairy, or any dog/cat feces please if you want to avoid horrible smells and, more importantly, attracting vermin. Also do not add poison oak/ivy (the irritants in poison ivy/oak do not break down), weeds with seeds, or diseased plant materials. The ratio for good composting is 50/50 for greens and browns which creates a friendly environment for nature's compost helpers (microbes, worms, etc); the greens provide nitrogen and the browns add carbon. Greens: kitchen scraps of veggies and fruits, rice/pasta, used tea leaves and coffee grounds, eggshells, garden clippings, livestock manure, etc. Browns: coffee filters, tea bags, stale bread, unbleached paper towels and napkins, drier lint, hair, dry leaves, sawdust, small twigs (no bigger than your little finger), wood chips, straw/hay, cardboard, etc. Lawn clippings should be dried out a bit before being added; fresh clippings become matted easily and create a slimy barrier deterring aeration. Once the compost bin is full, stir once a week to keep things aerated, moistening as necessary, and your compost will be ready in 4 to 6 weeks - this is called fast & hot composting. Or, you can choose slow & cold composting, which requires little or no mixing and takes about 4 to 6 months. When the compost is ready, it can be used in many ways. As a mulch, spread up to 3" thick around plants and on bare soil to conserve water, prevent erosion and control weeds. As soil conditioner, mix into the soil every time you plant new trees, shrubs, flowers, or vegetables. As potting mix, sift to remove large pieces. Mix together 2 parts compost with 1 part each of sand and vermiculite. Composting is a great activity for even young children. We made our own compost bin simply by using an old plastic container - about 8 to 10 gallon size - and drilled a few holes for air circulation and drainage. Fall was a good time for starting as it provided an abundance of leaves. We added any and all fruit and vegetable scraps including one of the favorites, edamame skins! The children learned about decomposition and were amazed to see their old and gooey Jack-O-Lantern disintegrate completely without a trace! The wondrous moment came when some of the seeds from the pumpkin added to the pile actually sprouted. The pumpkin plants grew right in the compost bin! The cycle was complete!! As my mother used to say, "If they have not learned the basics by 5, they are not going to learn at 50" - so good to start young :-)! Ever since we started the compost bin at school, children are enthusiastically bringing fruits and veggies for their lunch because they want to add their contribution of peels and cores to the bin. It was truly thrilling when some of the children who never brought so much as an apple started bringing more fruits and veggies! I am not exaggerating when I say that one child's daily lunch consisted of - 1 slice of white bread, a bag of potato chips, a few colorful cookies, and a fruit flavored drink. Now this child is bringing an apple in addition to her usual lunch and proceeds to eat it first until just the core is left for our compost bin. After a few days she proudly announced that she is going to bring an orange next time so she could put the peels in the compost bin :). Composting has been one successful project - learning about nature and healthy lunches! We not only got good compost for our garden, but also had the children eating a healthier meal - what a bonus!! I hope you enjoy composting. Have fun! Comments anyone?